Alternative energy continues to gain attention, and for good reason. Did you know the ground beneath your feet contains enough energy to heat and cool your home, and your domestic hot water? 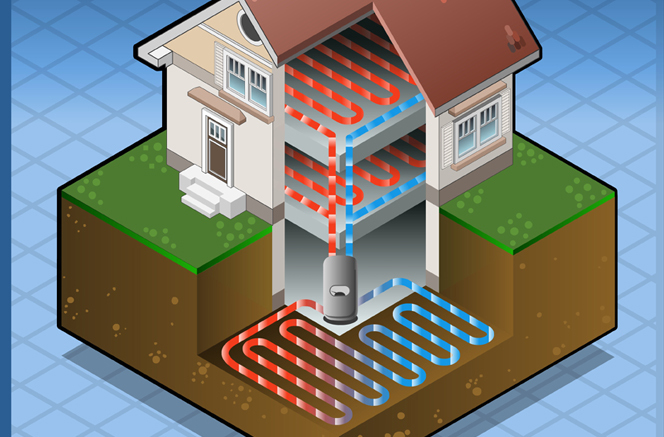 Heat stored in the ground can be used as a fuel source harnessed through geothermal heat pumps. 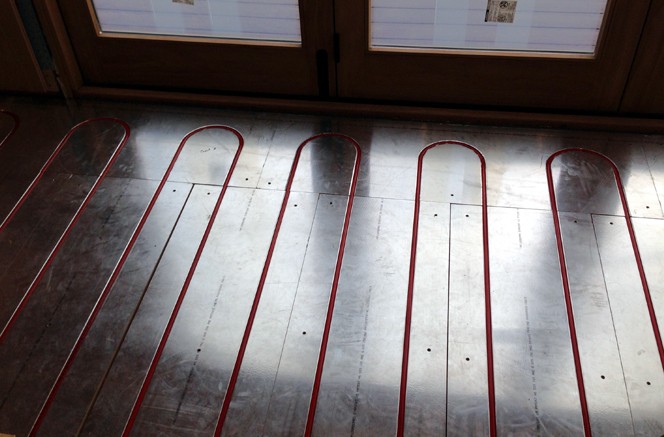 More and more people are catching on to this clean, renewable, readily available energy resource and their ability to further improve efficiency and comfort by incorporating Infloor radiant heating. 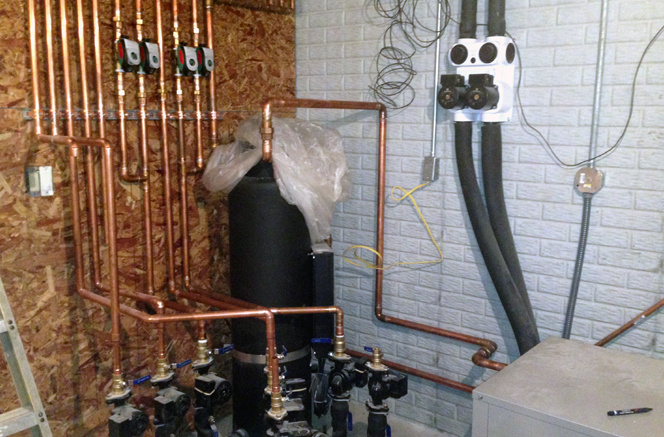 In January 2014, Cagle Heating & Cooling, LLC completed their first residential installation of a geothermal water-to-water heat pump (GHP) system with Infloor radiant heating for a family in Carlisle, IN. The system utilizes the constant heat from the ground to provide all the hot water needs for the home, radiant and domestic. The GHP exchanges heat with the earth through a ground heat exchanger. There are no boilers and no need for propane or natural gas. It only uses a small amount of electricity to drive the compressors. Geothermal is up to 400% efficient. Outdoor temperatures fluctuate with the changing seasons but underground temperatures don’t change much, thanks to the insulating properties of the earth. Four to six feet below ground, temperatures remain relatively constant year-round, between 50 to 60°F, depending on the geographic location. Thousands of homes and buildings across the country are using geothermal heat pumps to heat and cool buildings, cleanly and inexpensively. “More people need to know about this,” said Brad Cagle, President of Cagle Heating & Cooling, LLC. “I think this is the most efficient system there is, and the thing of the future,” he shared. They worked with Enertech Global, LLC for their geothermal needs, and Infloor Heating Systems for radiant flooring supplies and support. The new home totals just over 3,000 sq. ft. including the basement. 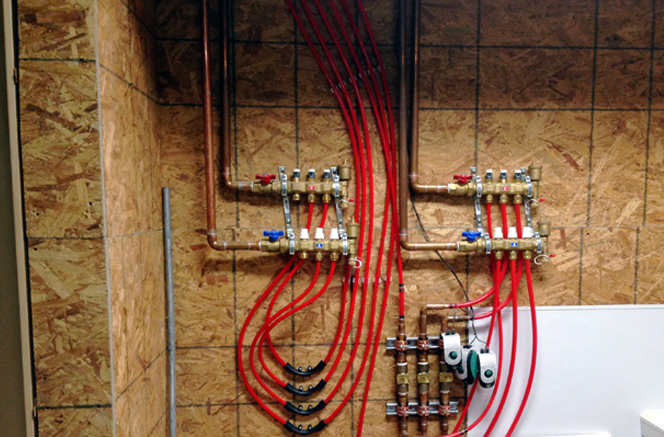 Cagle Heating & Cooling installed a 4-ton GeoComfort horizontal closed loop, water-to-water geothermal heat pump system. An additional loop was added to increase the capacity to 5-tons. Cagle chose Infloor Heating Systems’ signature product, Infloorboard, for the hydronic radiant heating installation method, which was put in throughout the entire living level with a hardwood floor covering. Each room is designated as a zone, with six total, giving every room individual temperature control for heating and cooling. 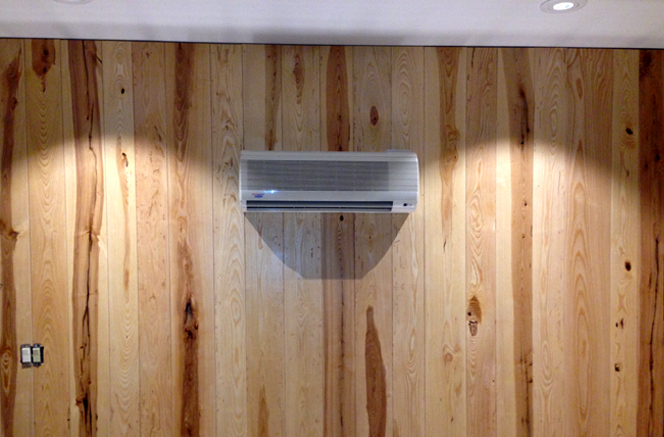 Ductless, mini split-system air-conditioners (mini splits) were installed in every room as the cooling source, each with their own temperature settings and remote control. 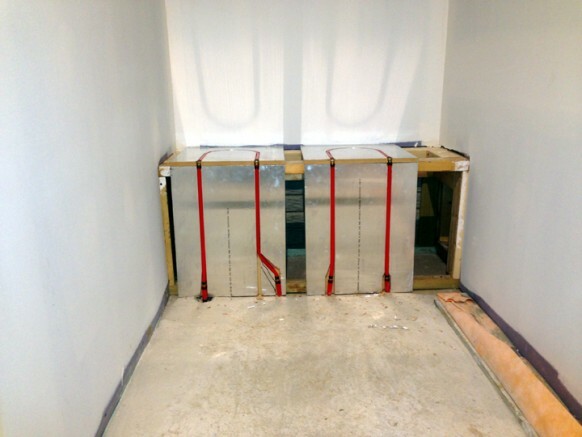 Hydronic radiant heating was also installed in the concrete in the basement, one of the best installation methods next to gypcrete and Infloorboard. 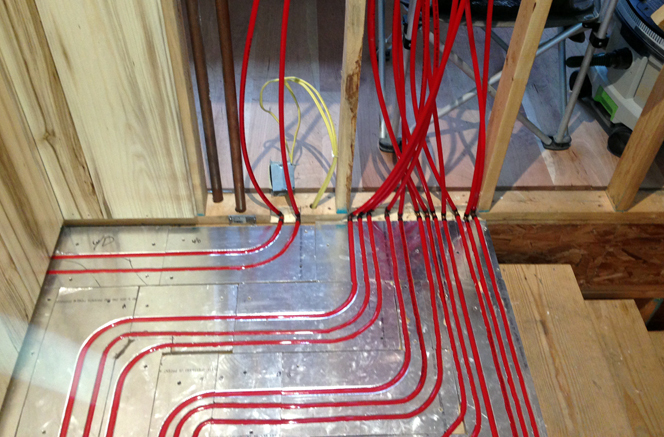 “Water-to-water geothermal heat pumps work great with correctly designed hydronic radiant flooring systems,” said Michael Willburn, President of Infloor Heating Systems. “Our 5/8” thick Infloorboard was the perfect selection for this project because it is easy to install and uses lower water temps to achieve the desired results,” he said. Infloorboard is an affordable, high-performance original Infloor product. “We also provided a LoopCAD design to take the guess work out of the installation process for them,” Michael said. The geothermal-radiant system is equipped with an HSS Series Tank; a non-pressurized stainless steel buffer tank making ground-sourced hydronic systems easier and more efficient. The HSS Series hydronic buffer tank is an all-in-one system that includes the pumps, controls, and valves for easy installation. The non-pressurized tank keep the air out of the system. It is a popular choice for these kinds of systems. There is also a 50-gal. high-efficiency water heater for the domestic water supply. It includes an additional heat pump for times of greater demand. 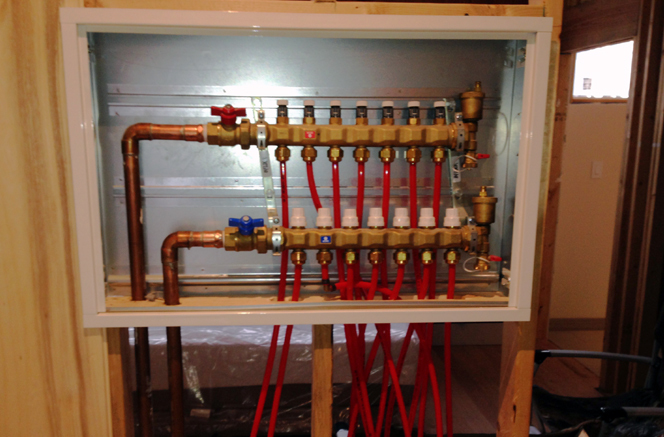 The entire radiant heating system is fueled by the geothermal water-to-water heat pump system, which is also fueling a cooling system and domestic hot water. How does this happen exactly? “The geothermal heat pumps create all the heat necessary for this home, even during the cold temperatures,” said Brad. “The system is working great and keeping the rooms at an even, constant temperature,” he said. These systems also come with the eligibility for tax credits and rebates. For example, the American Recovery and Reinvestment Act adopted in October 2008 allows for a 30% tax credit for costs associated with ENERGY STAR qualified geothermal heat pumps. The credit applies to geothermal equipment placed in service through December 31, 2016. With lower heat loss, and lower operating temperatures, these systems have the highest efficiencies and energy savings of any active heating system. Many regions of the world are already tapping into geothermal energy as an affordable and sustainable solution to reducing dependence on fossil fuels, which have been attributed to public health risks and global warming as a result of their use. Even though the installation price of a geothermal system can be several times higher than an air-source system of the same heating and cooling capacity, the US Environmental Protection Agency (EPA) reports that the additional costs are returned in energy savings in 5 to 10 years. The system’s life-expectancy is estimated at 25 years for the inside components and 50+ years for the ground loop. Geothermal energy is a type of renewable energy that encourages conservation of natural resources. According to the EPA, geo-exchange systems save homeowners 30–70% in heating costs, and 20–50% in cooling costs, compared to conventional systems. Geo-exchange systems also save money because they require much less maintenance, and are built to last for decades. This technology makes geothermal heating economically viable in any geographical location. A report in 2004 showed there were over a million geothermal heat pumps installed worldwide providing 12 GW of thermal capacity. Each year, about 80,000 units are installed in the USA and 27,000 in Sweden, growing by 10% annually. Geothermal heat pumps have been successfully used since the 1940s. Geothermal plants produce 25% or more of electricity in the Philippines, Iceland, and El Salvador. The United States has more geothermal capacity than any other country, with more than 3,000 megawatts in eight states. Eighty percent of this capacity is in California, where more than 40 geothermal plants provide nearly 5% of the state’s electricity. Since 1996, Enertech Global has been manufacturing and testing incredible geothermal systems in Mitchell, SD, and shipping them to contractors across the U.S. and Canada. Their brands include GeoComfort, Hydron Module, and TETCO. As a people-centric company, they believe in family values, loyalty beyond reason, assurance in quality craftsmanship, and making the world a better place. Learn more at www.enertechgeo.com. Cagle Heating & Cooling LLC, based in Sullivan, IN, is an established team of contractors equipped to handle all jobs, large and small. For the past 12 years, they have been committed to making sure their customer’s heating and cooling systems are functioning at a high level. What happens to the sun’s energy?